I recently did a webinar (Web based seminar) for the Truevolt series of DMMs. A question came up that I couldn't answer right away so I promised the person to blog about it. The question was about measuring injected current on the DMM. Since I didn't know how to do it off the top of my head I needed to do some research. 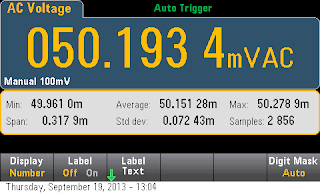 Truevolt's datasheet highlights the DMMs' low level of injected current but there isn't a line item on the spec sheet for what the injected current should be. 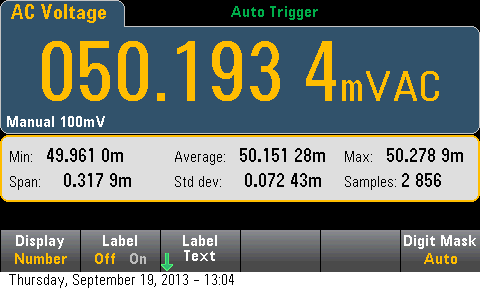 So I thought that I would measure the injected current and show my results on this blog. Keep in mind that this is not a specification and I'm only measuring on one unit, but it should give you an idea of the levels of injected current that you can expect. When I started my investigation I got confused on whether I should be measuring input bias current and did some research into that too. I'll speak about the differences below between the two currents and how to measure both signals on my 34461A. These techniques should be viable for any DMM that you have on your bench. Let's start off with the question from the webinar. 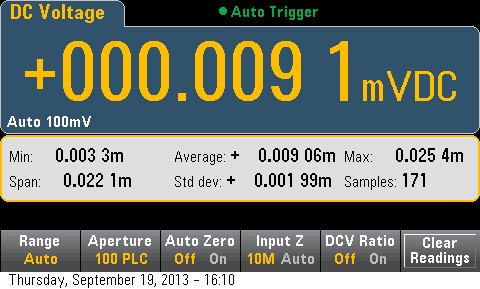 What's the injected current level of a Truevolt DMM. You might be also asking yourself what is injected current. Injected current for a DMM is low level current that comes from the DMM earth referenced circuitry such as the transformer. Since the DMM has floating inputs this current does not normally affect your measurements. However this current can be seen when your device under test's (DUT) signal is earth referenced as well. The injected current will affect your AC measurements if your signal is earth referenced or poorly isolated from earth ground. We typically characterize the injected current as an AC current. If a DMM is designed poorly, then this injected current can introduce large errors on your measurements. It turns out that the method to measure injected current is actually fairly simple for a DMM. The only connection that you need to make is to connect the high terminal to earth ground. Then setup your DMM to make ACV measurements.The connection is shown in this simple diagram. To make the earth ground connection, I took a BNA cable and connected it to the rear earth ground screw on the back of the DMM. I then took a few readings and used the 34461A's internal statistics to show what my average and standard deviation are. As you can see, the average was about 50mVrms with a standard deviation of 72uV. I did a quick check to see if the noise was normally distributed and it looked like a fairly normal Gaussian distribution. In order to calculate the injected current from this we simply divide the ACV measurement by the input impedance of the DMM which is 1Mohm for this function. 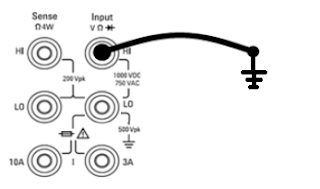 With this measurement method I can use the 1Mohm input impedance of the DMM in ACV mode as a high value shunt. So for my DMM the injected current is about 50nA. I'm not sure if this is typical but I would guess that most units would have less than 100nA of injected current. 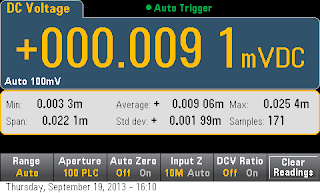 These levels are quite good for a 6.5 digit DMM and Agilent believes that Truevolt DMMs are among the top of the class for this parameter. I mentioned above that I started investigating input bias current because I thought it was the same thing as injected current. It turns out that input bias current is floating current that flows in or out of your DMM. This current will affect not only your earth reference measurements but your floating measurements as well. Luckily this is fairly small in most cases and the Truevolt DMM have a characteristic of <30pA at 25 C.
There are two methods of measuring Input Bias current (Ibias). One method requires knowledge of the DMM's internal input capacitance while the other is a more straightforward but not as accurate version. I used the more straightforward method since I don't know what the input capacitance of my DMM is and you might not either if you are using a different type of DMM. The connection to the DMM is even more simple. Keep the terminals open i.e. take off any cable or signals to the DMM. By setting the input impedance to 10M it will effectively bleed off any residual charge that might be on the terminals. I had my terminals open for a while before I started taking readings. So with the terminals open, I took a screen shot of a number of readings. 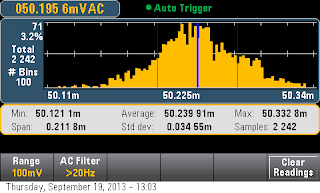 The screenshot also shows the DCV settings that I have which include the two setting changes from above. 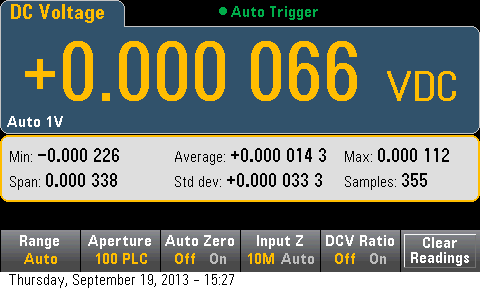 My average is 9uV. Then to calculate the Ibias current, all I need is a simple equation. With this measurement method I can use the 10Mohm input impedance of the DMM as a high value shunt. So the resulting Ibias = 9uV/10Mohm = 0.9pA. This result is for one unit but it does show that the input bias current of Truevolt DMMs is meeting it's specification with quite a bit of margin. Agilent's new Advanced Power System (APS) 1 kW and 2 kW system power supplies deliver a new level of power supply performance. The Advanced Power System (APS) family was designed with VersaPower architecture to help you overcome your toughest power test challenges by delivering industry-leading specifications and innovative features in an integrated solution for today’s advanced ATE power testing needs. To design the APS our product planner met with over 200 engineers all over the globe. These engineers shared with us their toughest power related test challenges and we specifically designed the APS product family to help engineers overcome the 9 most common power related test challenges. Below is a list of 4 out of the 9 test challenge the APS was designed to help you overcome. If you click on the title it will take you to a webpage with further information on the test challenge such as a video, application note, and more. At the end of this post you can find a link to a list of all 9 of the test challenges. Increasing test system throughput: Reducing test time can mean big savings, so achieving throughput gains is a never-ending quest. Building a continuous source and load: You need a continuous source and load solution for testing power storage DUTs. Protecting against power-related damage: When testing expensive DUTs, designing protection from power damage in the test system is critical. Characterizing dynamic current profiles: Your DUT has a current profile with a large dynamic range that you need to characterize. Both the N6900 Series DC power supplies and the N7900 Series dynamic DC power supplies provide five voltage and current combinations at the 1 kW power range and seven voltage and current combinations at the 2 kW power range. For more information on the APS and the test challenges it can help you overcome see the links below. If you have any questions related to this post feel free to email me.